Joshua DeFour has been making films since college, eventually dropping out of a journalism bachelor’s program in December 2010 to join the U.S. Marine Corps as a combat videographer and broadcast journalist. After leaving the Corps in March 2014, he was hired by Fathead, LLC. and created collaborative video spots with Warner Bros Pictures in support of the Harry Potter brand and a Father’s Day veterans feature in conjunction with Operation Homefront. 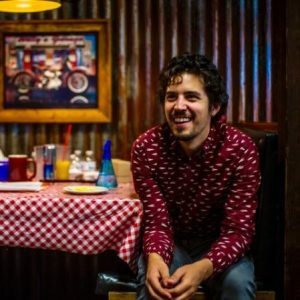 After being accepted into the University of Texas at Austin’s MFA program in August 2015, DeFour completed his first festival-circuit short films, “MATCH: A Tinder Tale,” “Baby Girl,” and “10 Minutes To Show.” His fourth film, “Plunge,” was completed in December 2017. FC: What led you to want to become a filmmaker? Josh: There were a lot of motivations that led me to filmmaking, but I think the biggest was an inability to express myself fully through writing. I had always wanted to be a novelist, or a journalist, some job or career that allowed me the opportunity to write and transcribe my ideas and vision—but the ideas in my head felt shackled, I couldn’t communicate everything I wanted to and I saw filmmaking as a way to fully express those ideas with every texture and palette. FC: Your entry into the world of film making was unorthodox. Was that a purposeful decision and how did you decide upon that route? Josh: I had always been interested in film, my mom was a filmmaker, and my friends and I were making little shorts and sending them to the university’s film festival. People enjoyed them and I wanted to continue, but I didn’t have the money or the confidence to drop out of my journalism program and take that next step. I wanted to pursue film at a different university, through an actual film program. Combined with being completely lost at that age, I gravitated to the military because of the combat videography occupation and the chance to get out in the world. I believed the military would give me purpose, make me a stronger person, and provide life experiences that would inspire me as a storyteller. On top of that, they would teach me how to shoot, edit, and make video news stories and spots for free. I chose the Marines because I wanted a challenge,to be transformed, and I knew I would shoot some amazing footage that could get me into film school! FC: How did your experience as a Marine influence your storytelling technique as a filmmaker? Josh: I think being a Marine and coming from that background of efficiency, strong leadership, and making do with what you have really influences my set and how I direct my crew. I like our day to be planned of course, but I’m not afraid to improvise and I wholeheartedly embrace that challenge. I also developed a low tolerance for negativity and overages, so I expect my crew to come to set with resiliency and the energy to fight through whatever comes our way—and to do so on schedule. But I don’t yell or stomp around, and I think I’m able to stay calm under pressure because it’ll never be Afghanistan! I also brought the “sit-rep” concept to the end of every shoot day—the entire cast and crew stand in a circle and everyone gets to voice their kudos and concerns so we can adjust and make changes for the next day. This eliminates communication bottlenecks and keeps everything open and transparent, I’ve found that really helps develop trust and a calmer set overall. FC: What led you to take a docu-drama approach to telling the story of “The 11th Order”? Josh:: I took all of the research I had for the true events, all of the stories and details I could find and then tried quite a few different narratives in order to find the most coherent, fully realized version. A few of the readers I worked with gave suggestions to take the film “outside the box,” to put a spin on it and give it more artistic liberty. But in the end I just felt those were deviations for the sake of being clever; those changes didn’t improve the storytelling and they lessened what made the true events so visceral. A “docu-drama” allowed me to make the story compelling, use artistic license where it was needed, but put the audience right next to those Marines and provide the authenticity the story deserved. FC: In making a film about an event taking place during a war, were there any films that you took inspiration or guidance from? Josh:: This film’s style was most inspired by the HBO miniseries “Generation Kill,” which is the best modern interpretation of U.S. Marines out there. On the film front I literally bought and studied every war film from the past 40 years to find what I liked and disliked, and what I wanted to emulate. For a storytelling guide I looked to “Saving Private Ryan,” which features some of the greatest dramatized camaraderie and military dialogue of all time, in my opinion, and “Fruitvale Station” for its emotional impact and narrative structure. I looked to “Sicario” for the tone and visual style, “Babel” for its music and cultural realism, and “Lone Survivor” as an example of what I’m most trying to avoid–any glorification of violence. FC: How did the idea for “The 11th Order” come to you? Josh:: “The 11th Order” came to me by way of a fellow Marine veteran who gave me the speech the film is based on, a eulogy by General John Kelly titled “Six Seconds To Live.” I had been long avoiding any project associated with the military because I didn’t want to be pigeon-holed, and because there were a lot of memories and experiences I preferred not to dig up. But after reading the speech I was immediately affected, and I read it three or four more times that night and couldn’t shake the impact, the story, and the power of the event itself. I spent the next week thinking about the speech on and off, I felt a responsibility having read it and knowing I could make this story into a film; that no one had and believing that the story needed to be shared. I knew the immense challenge that would be involved with production but I felt that I’d never forgive myself if I walked away from this story. FC: What challenges did you face in pulling the story together so that it worked as a film? Josh: The biggest challenge came down to the protagonist, and which of the three main arcs of this story would be the true focus and through-line for the audience. I always knew the backbone of the film would be the speech by General John Kelly, that character and the eulogy would provide the film’s narration. But the real challenge, the true struggle that led to many a sleepless night, was choosing whether to focus on both of the Marines or just one. No matter the revisions, by focusing on both Marines the page count would either expand far beyond practicality or neither character would be properly developed. This was extremely difficult given that both men had died, both men had an equal share to the story. In the end it made the most sense to choose the younger Marine, LCpl. Jordan Haerter, because he had just arrived in Iraq for the first time and it provided the audience a seamless introduction to this new world through his eyes. And once he’s finally in Iraq we’re able to cross paths with the other Marine, Cpl. Jonathan Yale, and then develop the characters in unison. This was a major turning point during initial development and really focused the film moving forward. FC: Can you tell us about how you came to work with Filmmakers Collaborative? Josh: My producer, Lauren Izard, and I learned about Filmmaker’s Collaborative through our friend and fellow FC filmmaker, Shelby Hadden. Shelby was submitting for grants and seeking additional funding for her newest documentary, “Tightly Wound,” when she heard about our project. We had no idea such an organization existed, or even could exist! Filmmaker’s Collaborative is such a perfect marriage of artist development and support, it provides a very crucial conduit that allows the production to apply for government assistance, corporate donations, and private grants that are usually only available to non-profit organizations. That’s a huge advantage, and then add the reduced crowdfunding fees in comparison to Kickstarter and Indiegogo and suddenly there’s drastically improved financial flexibility.